Looking at post-war Hollywood cinema we find many disaster movies, which may be sorted into many categories according to the source of anxiety they present. (See here for a survey). The major disasters that have thrilled American audiences have been focussed on transport (especially aeroplanes) that goes of control (e.g. the Airport movies, Speed, The Big Bus, etc) and geological/meteorological events (e.g. Dante’s Peak, Earthquake, Volcano). You might expect that climate change would make an appearance in the latter category as a contemporary source of anxiety that could be used to provide the catastrophic event that sets in motion the story of a plucky band of survivors. Occasionally, this has been the case in films like The Day After Tomorrow and, more recently, 2012. However, these are exceptions to the rule and , in general, Hollywood has not really dealt with climate change to any great degree. One reason for this is simply that climate change is not very dramatic – it is certainly not as dramatic as a giant meteor smashing into the Earth (e.g. Meteor, Deep Impact, Armageddon) – and does not, therefore, provide the tension necessary for the disaster movie. The crisis of climate change is chronic rather than acute, and the disaster movie needs acute events to impel its characters to action. The threat must immanent and must be dealt with immediately. It is also very hard to show climate change happening – icebergs do not explode in the same way as a crashing plane or a building hit by a giant space rock. Climate change might be motivated as a cause of an event that we do not witness, but which does explain why human society finds itself living in a post-apocalyptic landscape. Waterworld is a good example of this use of climate change as background event. But as a background event, climate change is inevitably glossed over as something explodes. The first explanation for the absence of climate change movies is therefore quite simple – climate change is dull. There is also a second factor to consider: the fact that Americans do not want to watch films about climate change. If we take the US box office gross for a group of films that can be loosely collected together under the heading of ‘climate change’ and we divide this by the average ticket price (from the National Association of Theatre Owners) then we have an estimate of the popularity of a film expressed in terms of the number of ticket sales. This makes it possible to compare films from different years more directly than using the box office grosses. This information is presented in Table 1. What is immediately apparent is that, relative to some recent disaster movies (Table 2), the number of attendances is generally much smaller – though obviously not in the case of Avatar. Clearly, Nobody went to see The 11th Hour – a documentary narrated by Leonardo DiCaprio – but An Inconvenient Truth did respectably for a documentary. 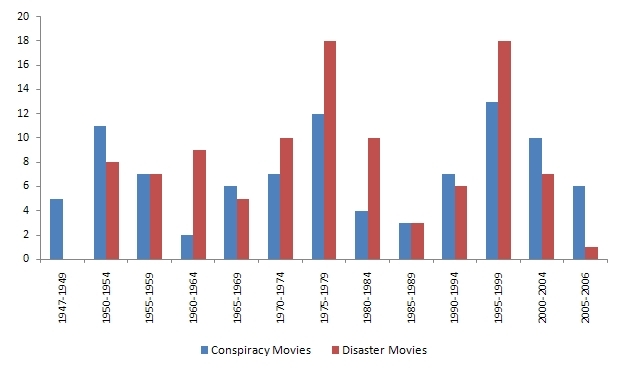 Of the ‘environmental films,’ only The Day After Tomorrow comes close to the other disaster movies.Although only a brief survey of a handful of films, it does appear that the place of the climate change film in the disaster genre is limited, and that American audiences will go to see non-environmentalist disaster movies in far greater numbers. One reason for the limited number of climate change disaster movies is that they are simply not popular (i.e. not profitable) enough. Unfortunately, getting data for a direct comparison of US audiences with non-US (especially European) audiences is somewhat difficult. (It is traditional at this point to say something derogatory about Armageddon but I actually really like this film – it’s good fun and much better than Deep Impact). Finally, as an interesting aside, here is a report from World Environment Day 2009 on a solar-powered cinema in South Yorkshire.